Republican presidential candidate Sen. Rand Paul reintroduced a bill Monday that would take the teeth out of any presidential executive order that would “infringe” on the Second Amendment. “In the United States, we do not have a king, but we do have a Constitution. 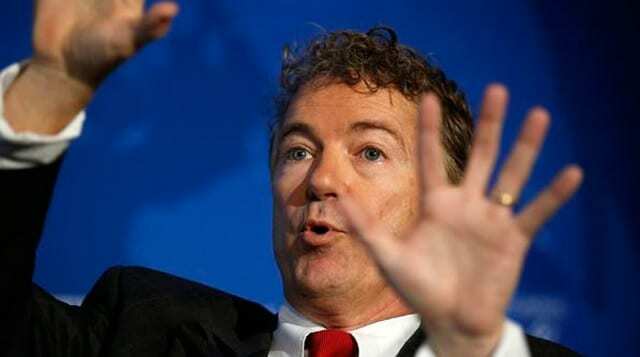 We also have the Second Amendment, and I will fight tooth and nail to protect it,” Paul said in a statement. The six-page bill, the Separation of Powers Restoration and Second Amendment Protection Act, would prohibit funding for any presidential order intended to implement gun control action by bypassing Congress. Paul’s bill is a pre-emptive measure that embodies conservatives’ fear that Obama will try to impose an authoritative response to a high-profile mass shootings without the approval of Congress. Although polls show public opinion overall continues to approve some of the legislation, i.e. background checks, Congress has failed to pass significant legislation that addresses the issue. Yet, as Obama enters his final year in office, a spokesman with his administration said he will review in a matter of “weeks not months” final recommendations on how he can impose new gun restrictions without going through Congress, according to recent reports. The president had a pow wow with Michael Bloomberg, former New York City mayor and leading gun control advocate, on Dec. 16 to discuss how to prevent gun violence at the state and local level, and climate change. Some expected Obama to announce a plan for executive actions during a rare primetime address in the aftermath of a mass shooting in San Bernardino, California, on Dec. 2 that claimed the lives of 14 people and injured 22 more. Instead, he urged the country to pressure lawmakers to pass gun control legislation such as denying the sale of firearms to those listed on a terror watch list. Compared to the numerous high-profile mass shootings in 2015, the San Bernardino shooting is uncommonly complex. The suspects involved were a husband and wife who became homegrown radicalized Muslims, a pairing of two concepts that Republicans say are leading threats for Americans. However, Republicans disagree that gun control laws would reduce the risk of a future mass shooting and also dismiss the validity of the no-fly list, which did not contain the names of the San Bernardino shooters (they had obtained their guns through a straw purchase). The Separation of Powers Restoration and Second Amendment Protection Act was originally introduced on Jan. 23, 2013, just three days before President Obama introduced a 23-point plan to curb gun violence in response to the shooting deaths of 20 first-graders and six educators at Sandy Hook Elementary School in Newtown, Connecticut, on Dec. 14, 2012. The bill stagnated just after language was introduced on Jan. 28, 2013, and the president’s executive actions, such as granting funds to be dispersed by the Justice Department, continued to advance. But the Obama Administration’s key legislation, a universal background check bill, died in the U.S. Senate in April 2013 thanks to plans to filibuster by Paul, his fellow Republican presidential candidate Sen. Ted Cruz, and Sen. Mike Lee.